In our day to day life, we are dependent on numerous products for our comfort. We can’t think of any single day without them. Most of them are electronics in nature. But when there is any shortage of power supply or electricity, we have to use generator for providing the necessary power supply to the electronic products. Sometimes, we need portable generator for programs and parties or picnics. But it is not so easy to find out the best quality generator. This is why, I am here to help you out. Duromax has come up with the best item. 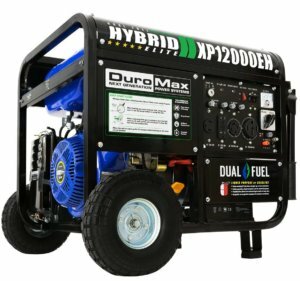 The Portable DuroMax Dual Fuel XP12000EH Generator is hopefully on your list of generators you are considering in your search. In comparison with other products, the DuroMax XP12000EH has earned a huge reputation. This very portable generator will give you confidence to live happily knowing that you have a backup in case of necessity. So let’s have a look at the features, pros and cons of DuroMax XP12000EH generator. 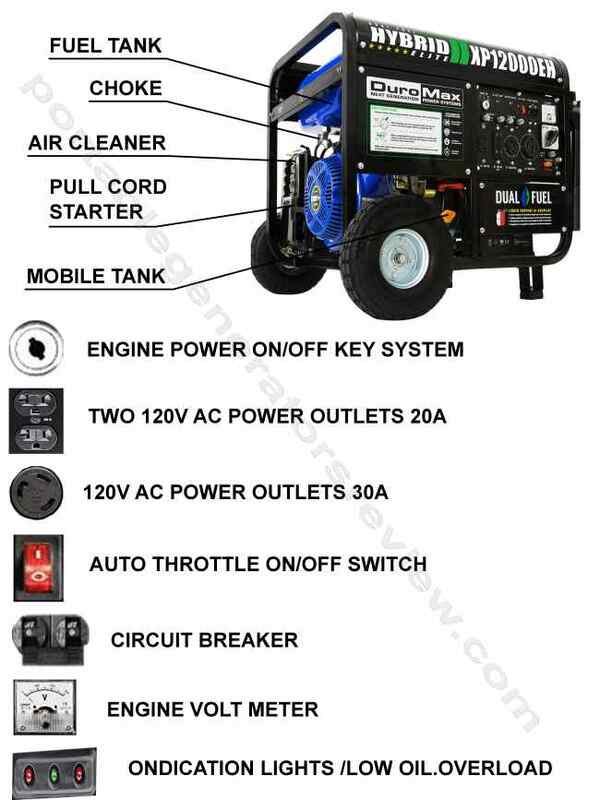 The features of DuroMax portable generator are very much unique. This uniqueness has made this generator more exceptional among other products. The DuroMax XP12000EH generator is designed with the dual fuel technology. It refers to the ability of the generator to provide power supply by using propane or gas. This dual fuel technology enables you to have maximum running time with the minimum level of maintenance. The generator is equipped with four points of motor mount which are fully isolated. This heavy duty framework offers quiet operation smoothly. This portable generator has been provided with full power panel which include light for oil warning, circuit breaker, volt meter and other power outlets. The generator is run on auto shut-off mechanism which protects this product from damage when there is scarcity of oil. It saves the engine. It is identified as one of the most unique features by the customers. The Duromax generator has the 50% maximum outputs on gasoline which have life-time of 10 hours. When it is on propane, it can render 50% maximum outputs which have run-time 20 hours. The quiet muffler system reduces the noise of the engine. It will not hamper the environment. The most common feature is that the generator is portable too. It can be moved easily with the folded handle and two wheels. The rubber stop is for making it fixed when it becomes stationary. The 12000 watt of horse power gives the generator to perform its duty with versatility and best support when you are out of power supply. Each and every things in this world has pros and cons. Nothing is without its darkness. Below is an overview of the pros and cons of this Dual Fuel Portable Generator the DuroMax XP12000EH . 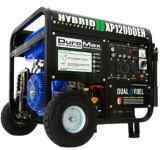 DuroMax XP12000EH generator is very light in weight. The engine is 457cc OHV. The generator is portable in nature. Perfect for carrying and moving as it has two wheels and folded handles. It can be stored anywhere as it is portable. It runs on the dual fuel technology. It can be run either on propane or gas. The 12000 watt battery provides the horse power. It has a sturdy frame. The shut-off mechanism permits the generator to save the engine from damage. Maximum run-time for minimum maintenance. Its run-time depends on the fueling. But it can provide power 10-20 hours. The DuroMax XP12000EH takes a few more space for storage comparing with other portable generator. Customers often asked some common questions regarding any products. We name them as the frequently asked questions. The frequently asked questions of DuroMax XP12000EH portable generator are given below. What is the capacity of the battery? The battery takes 12000 watt. Yes. It is. But some customers identified it as more space-taking portable generator. Is this generator offers heavy feeling with the heavy duty? No. It is very much light in feeling. What is the run-time of the generator? When it is run on gasoline, this generator will run up to 10 hours maximum outputs. Depending on the propane, the life-time can be extended up to 20 hours. How can we identify the low level of oil? The shut-off technology will provide you this support in this context by shutting down in case of low level of oil as it hampers the engine. Is there any possibility of short-circuit? Not at all. If there is any incident of short-circuit, the circuit breaker will do the job. What is the noise level of the engine? You will be glad to know that the generator has quiet muffler system to reduce the noise level. This makes it a fairly quite generator while operating. When you are planning for a outing to a place where there is no supply of electricity or a chance of shortage of electricity, you will definitely think about having generator, in fact it is portable generator. Planning something enjoyable includes the supply of power for music, lighting etc. That is why, you need to think about choosing a quality generator. While concluding the discussion, I can assure you that the DuroMax XP12000EH generator has a package of maximum positive features. The high quality power panel set up combines all the elements of providing a secure power supply. The 12000 watt battery renders the horse power which is often termed as the beast. Your major appliances will be powered with the beast strength. Don’t worry about the weight. The review says that it feels light-weight. Moreover, the quiet muffler system controls the noise from being loud. Two wheels are attached with the generator and a folded handled to control it. You will be amazed hearing that there are circuit breaker, volt meter and shut-off technology which are worthy of your money. Above all, you will have to be a bit careful while considering those factors with your priorities.